Grown throughout the tropics, sweet potatoes are often confused with yams…another starchy root vegetable but they are not even in the same family. Yams are larger in size than sweet potatoes and have been known to grow up to 120 pounds in weight. The easiest way to distinguish a yam from a sweet potato is by checking the skin (you can’t always trust what the grocery store sign indicates). Sweet potatoes are smaller with a very thin peel whereas larger yams have thicker, rougher, dark brown to pink skin. 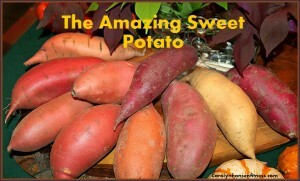 Sweet potatoes are starchy veggies that come in a variety of colors (400 varieties): orange, brown, purple, and white. This orange colored tuber has an amazing array of nutrients to offer among them are antioxidants, anti-inflammatory nutrients, as well as blood sugar-regulating nutrients. Several recent studies have shown that sweet potatoes raise our blood levels of vitamin A and may be one of nature’s unsurpassed sources of beta-carotene. Rich with vitamins, minerals and dietary fiber, sweet potatoes contain an impressive wealth of carotenoid pigments and some studies have shown sweet potatoes to be a richer source of bio available beta-carotene than green leafy vegetables. The intensity of the orange or yellow flesh colored sweet potato is a direct indicator of its beta carotene content. Beta-carotene is only the beginning when it comes to the powerful antioxidants that sweet potatoes offer. Purple fleshed sweet potatoes are a great source of anthrocyanins with outstanding anti-oxidant activity. 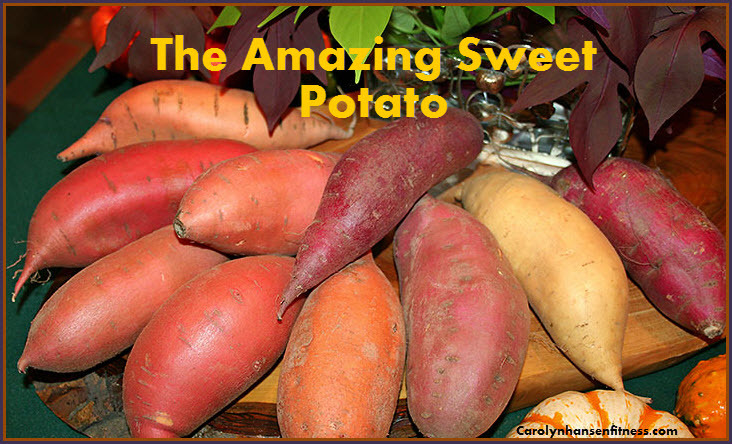 A truly amazing thing about sweet potatoes is that the anti-oxidant capacity has shown differing genes at work in the skin versus the flesh producing different concentrations of anthocyanin antioxidants. Many people are not aware that you can also eat the green leafy tops of the sweet potato. These power greens contain more nutrients and dietary fiber than many dark green leafy veggies and are often used in soups. If kept in a cool, dark, well ventilated place, sweet potatoes will keep approximately 10 days. Make sure they are not stored near any heat sources like the stove. Sweet potatoes are easy and quick to prepare, taste delicious and are a true “sweet treat” for your body. Preparing them is as simple as cutting them into ½ inch slices and steaming them for about 7 minutes. This brings out their awesome flavor and helps to maximize their nutritional value. For added flavor don’t be afraid to experiment with spices. Cinnamon, nutmeg, and cloves all add extra flavor as well as added nutrition. A sweet potato is an excellent carb source option for those busy days when you’re rushed in the morning. Simply place the potato in the microwave before heading out, wrap it in tin foil and then pack the rest of the ingredients. Heat the potato up before lunch and assemble together. Or, prepare fresh at home—whatever works best for your schedule! After finished, slice in half and slightly separate. Top with cottage cheese, cheddar cheese, and sprinkle over green onions and peppers. Finally, spoon on salsa and serve as a simple meal that will get you through the afternoon. That’s just one of many delicious recipes included in “Rebound Free Weight Loss”…where you’ll learn why your mind and body must be healthy first if you want to lose your excess weight and keep it off.